Visit Lake McKenzie and other popular locations on the island! The 4 day Whitsunday Getaway and Fraser Explorer combo offers one of the most luxurious ways to see the beauty of the Whitsundays and Fraser Island. Start by taking a cruise through the tropical archipelago on board a comfortable catamaran and finish with your trip by enjoying Fraser Island from on board a cruisey 4WD! This package will provide all the best during your 4 days and 3 nights of exploring and adventuring on the east coast of Australia. Whitsunday Getaway is one of the most luxurious overnight sailing tours in the Whitsundays. 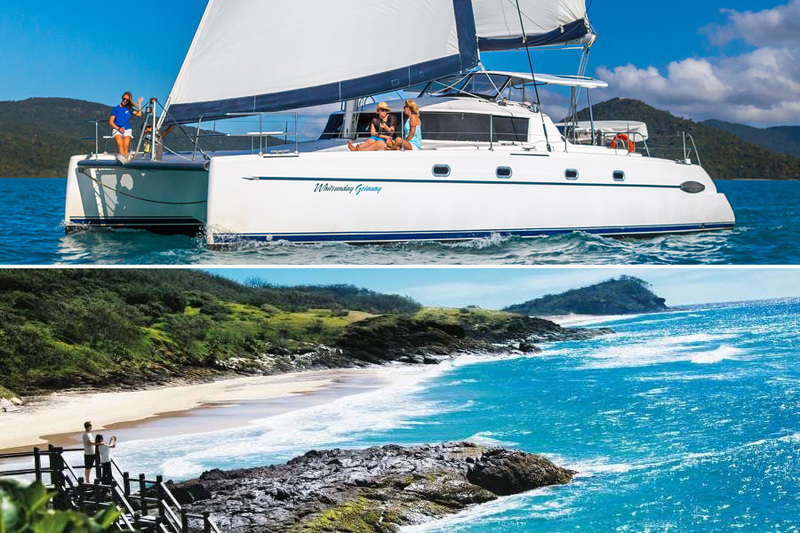 It is a comfortable, stable catamaran that sails the Whitsundays for 2 days and 2 nights and visits all the top destinations including Whitehaven Beach, Hill Inlet Lookout and several reefs around the islands themselves. Guests will get to indulge in private queen cabins with ensuite bathrooms and will get to enjoy the company of 3 other couples as they make their way around the islands for an unforgettable adventure. Guests will get to enjoy all the best parts of the Whitsundays while onboard Getaway. Passengers will get to spend their days exploring all the best parts of the islands and the nights relaxing on board a comfortable and spacious catamaran alongside their loved one. Fraser Explorer offers guests a perfect way to see all the beauty and secrets of Fraser Island. This trip is ideal for those who would prefer to sit back and enjoy the ride, rather than drive themselves as your guide takes you around the island. This 2 day and 1 night tour includes accommodation at Eurong Resort, as well as meals and all the comforts you will need to enjoy your tour of the world's largest sand island. Fraser Island is full of amazing natural attractions, including lakes, creeks, sand dunes and more. While on Fraser Island, guests will get to explore some its most beautiful destinations, including Lake McKenzie, Maheno Shipwreck, Eli Creek and Central Station, where they can explore and relax, taking it all in. They will get to enjoy all the stunning parts of Fraser Island from on board a comfortable 4WD where all they need to do is sit back and enjoy the ride! Nights will be spent at the comfortable Eurong Resort in a motel-style accommodation. The Whitsundays and Fraser Island are over 900 KM apart. Please ensure you allow sufficient time to get to each destination. This package may not be suitable if you have an existing neck or back problems or are pregnant. Check with your agent to make sure this tour is suitable for you.